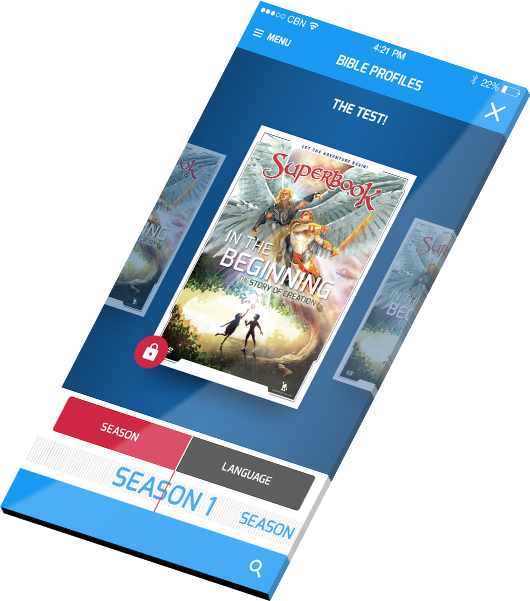 Free Kids Bible App with Videos & Games from Superbook - Download the Bible App for Kids and Let the Adventure Begin! Download the Free Bible App for Kids! This Free iPad & iPhone Bible App, Free Android Bible App, Free Kindle Bible App for kids is a media-rich experience that helps bring the Bible to life with videos and images from the Emmy nominated SUPERBOOK animation series as well as engaging interactive games. Now featuring full-length, FREE EPISODES from the Emmy nominated Superbook series including David and Goliath, The Ten Commandments, Daniel and the Lions’ Den, and The First Christmas! Superbook Kids Bible App for iPhone, iPod and iPad. Superbook Kids Bible App for Android. Superbook Kids Bible App for Kindle and Kindle Fire. • Videos and interactive content embedded within the Bible, so kids can easily interact with each chapter of the children's Bible. • Biblical answers to hundreds of questions that are common to children. • This free kids Bible app also includes profiles of people, places and artifacts found in the Bible. • Dynamic video clips from the Emmy-nominated animation series – SUPERBOOK. • Images of Bible characters, places and artifacts enhanced with detailed biographies. • Find Biblical answers to questions that are important to kids – questions about life, Jesus and the Bible – in the SUPERBOOK Q&A Contraption. • Choose the right answer in an engaging trivia game – important questions with fun Biblical answers. • Try to find all of the hidden words in a challenging Word Search game. • Experience a kid-friendly sharing of the Gospel message. • Take notes and attach them to Bible verses. • Favorite/bookmark Bible verses that you like. • Highlight passages with multiple color choices. • Add your own photos within the Bible, so that you can make a personal connection with a verse. For example, if you want to remember to pray for a friend, you can attach a photo of that friend to a verse, which can remind you to pray for them, or maybe you’ve photographed an incredible sunset, so you can take that photo and attach it to Genesis 1:3 where the Bible shares about God creating light. • A complete collection of your notes, favorite verses and personal photos can be accessed from the My Stuff area of the children's Bible app. 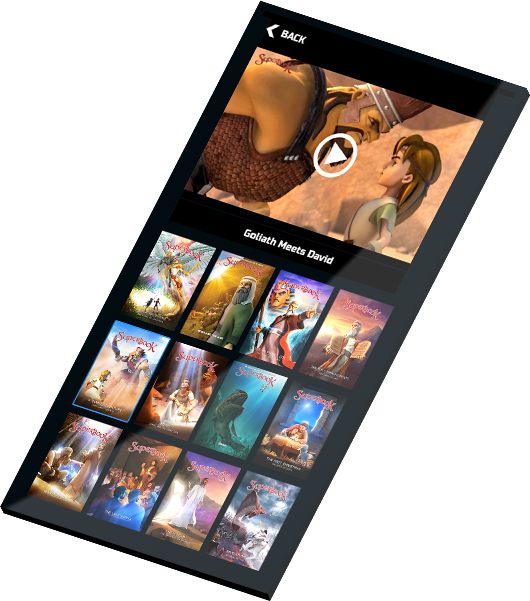 • You can also choose different fonts and font sizes, change your screen to have a cool black background with white letters and trade out the background of the home screen to different images like heaven or the temple in Jerusalem. 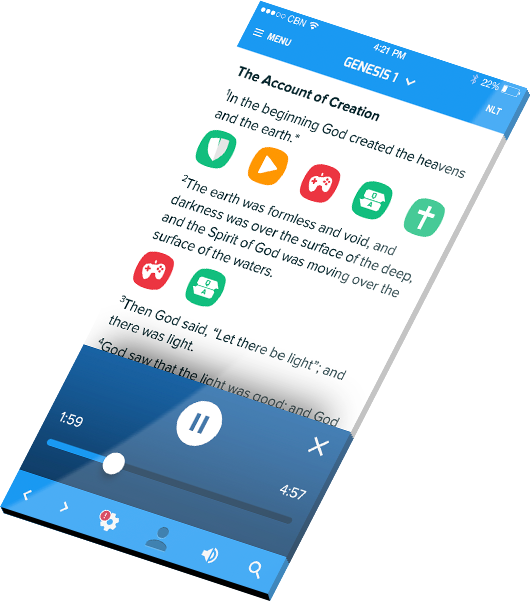 • The SUPERBOOK Free Kids Bible App includes multiple Bible versions plus audio for the New Living Translation. • You can also email your favorite verses, personal photos with related Bible verses and your notes to friends. So download the SUPERBOOK Kids Bible App for the iPhone, iPod and iPad, the Kids Bible App for Android, the Kids Bible App for Kindle and Kindle Fire and get ready to start the adventure of a lifetime! My kids love this. Thank you for making something biblical and fun and educational! 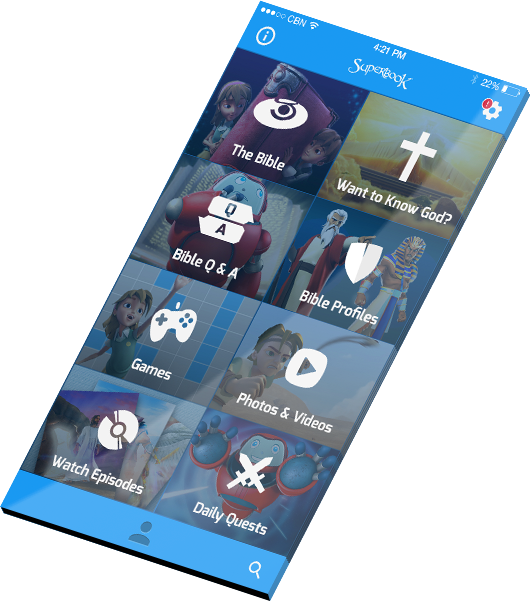 Awesome app – Very nice for the kids… My kids enjoyed it and they are learning a lot and its nice to see the kids spending time in Gods word through this app...Great work! This is a great app! The videos are amazing and the bible has lots of fun interactive features. Superbook Kids Bible App for iPhone, iPod and iPad. Click here to download the iOS Bible app for kids! Superbook Kids Bible App for Android. Click here to download the Android Bible app for kids! Superbook Kids Bible App for Kindle and Kindle Fire. Click here to download the Kindle Bible app for kids!